Pfc. Jesse J. Vizzini of Fayette was among 80 Iowa Army National Guard soldiers recently recognized during a patching ceremony held at the Camp Dodge Joint Maneuver Training Center in Johnston, Iowa. The patching ceremony represents a time-honored tradition, where Iowa citizen-soldiers officially receive the left-shoulder military patch representing their unit of assignment in the Iowa Army National Guard. The event also marks completion of the Iowa National Guard Recruit Sustainment Program, a preparatory training program that provides new recruits the education and skills needed to excel during their Army Basic Training and Advanced Individual Training (military school). These soldiers represent today’s Iowa Army National Guard, which consists of 7,000 citizen-soldiers based in more than 40 communities across the state. Vizzini, a business administration major at Upper Iowa University in Fayette, now becomes an intelligence analyst with the Headquarters and Headquarters Company, 1st Battalion, 133rd Infantry in Waterloo, Iowa. Intelligence analysts are primarily responsible for the analysis, processing and distribution of strategic and tactical intelligence. They are integral to providing Army personnel with information about enemy forces and potential battle areas. 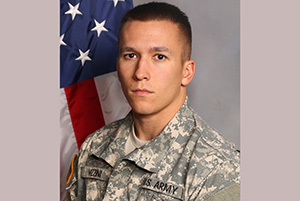 A 2014 graduate of Cedar Rapids Prairie High School, Vizzini was named Distinguished Honor Graduate upon graduation from his 16-week Intelligence Analyst Course, located at Fort Huachuca, Arizona. He also scored a perfect 300 points on his Army Physical Fitness Test. By completing Basic Training and Advanced Individual Training, the UIU student is now eligible for the Iowa National Guard Educational Assistance Grant (NGEAP), a state-funded tuition assistance program for Iowa National Guard members who attend Iowa community colleges and four-year colleges and universities, both public and private. Under this program, Iowa National Guard members receive tuition payment up to 100 percent of the State Regents’ rate, an amount up to $7,108 per academic year. Vizzini, the son of Robert and Sharon Vizzini, of Cedar Rapids, Iowa, is also eligible for the Reserve Component GI Bill that pays a soldier up to $600 per month while attending college, technical college or vocational trade schools. He will also receive monthly drill pay and 15 days of paid duty each year for Annual Training.